A handsome cast iron pipe footbridge, the main purpose of which is to carry a large water main across the River Hodder. It's possible that a little more care than usual was taken with the design in order to placate the Towneley family, whose land the water main had to cross. The bridge's four spans are composed of a pair of arched cast iron girders with openings in the spandrels. 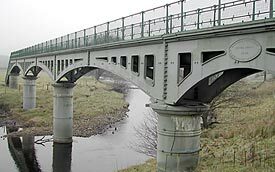 The girders are made up in sections, two per span, bolted together at midspan (four bolts) and over the colum supports (six bolts). The griders are 2.1m deep at their deepest points. The transverse brackets that connect the girders support the water main and the footpath runs on top. The bridge is supported in a single row of cast iron tube columns. Their exterior diameters are 1.58m and the cast iron is 32mm thick. Each column is filled with concrete made using gravel from the river bed.